(CNSNews.com) - President Barack Obama had an average approval rating of 47.9 percent during his time in office, according to the Gallup poll. 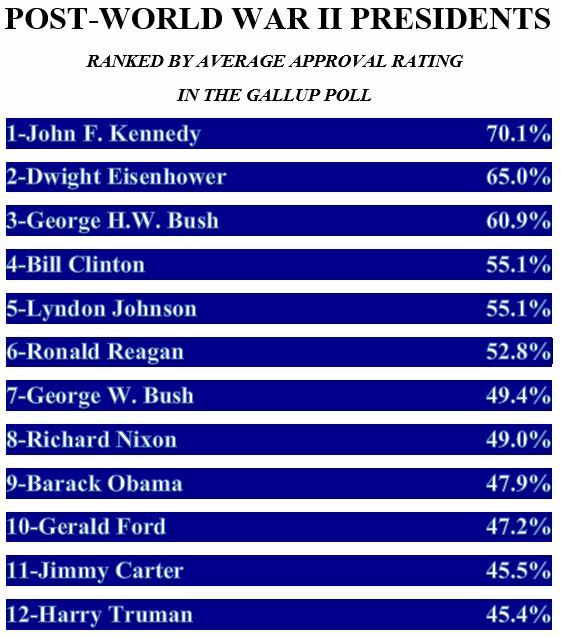 John F. Kennedy ranks highest with an average approval rating of 70.1 percent. He is followed by Dwight Eisenhower (65.0 percent), George H.W. Bush (60.9 percent), Bill Clinton (55.1 percent), Lyndon Johnson (55.1 percent), Ronald Reagan (52.8 percent), George W. Bush (49.4 percent), Barack Obama (47.9 percent), Gerald Ford (47.2 percent), Jimmy Carter (45.5 percent) and Harry Truman (45.4 percent). Obama’s lowest approval ratings coincided with events focused on the debt, employment and the Islamic State, Gallup reports. “At various points in his presidency his approval ratings dipped to 38%,” said Gallup. “This included in August and October 2011 after contentious negotiations over the debt ceiling limit and subsequent downgrading of the U.S. credit rating. Obama also failed to generate sufficient support for legislation designed to address the still-weak employment situation. “Obama's approval ratings also fell to 38% in September 2014, shortly after the Islamic State terrorist group released videos showing the beheadings of U.S. journalists captured overseas,” Gallup said.